The Nursery opened in October 2013 and has built up a very steady intake of children during this time. If you wish your child to be considered for a place please complete the basic ENROLMENT FORM which serves merely to express your interest and requirements. There is no charge for being on the waiting list and you will be contacted as soon as we are able to confirm a place for your child. 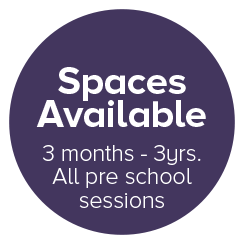 Once we are sure that we have a suitable place for your child, we will contact you to confirm the start date and we will send you a PLACE OFFER LETTER requesting a £50.00 registration fee and the deposit. The deposit will be £100 per day of attendance to be paid, for example if your child will be attending 2 days per week your deposit will be £200.00 + the £50.00 registration fee.